One of the most popular products from Earth Friendly range. This eco-friendly cleaning product will help to remove any chemicals, pesticides, dirt etc from the surface of your fruit and vegetables. It is guaranteed to be completely tasteless and with its 100% natural ingredients, you can be assured no chemicals have been used making this a completely safe product for your use on your food. Simply spray on and rinse off - works quickly and easily, with no need to scrub or soak! water, denatured alcohol, < 5% non-ionic surfactants, potassium sorbate, and citric acid. 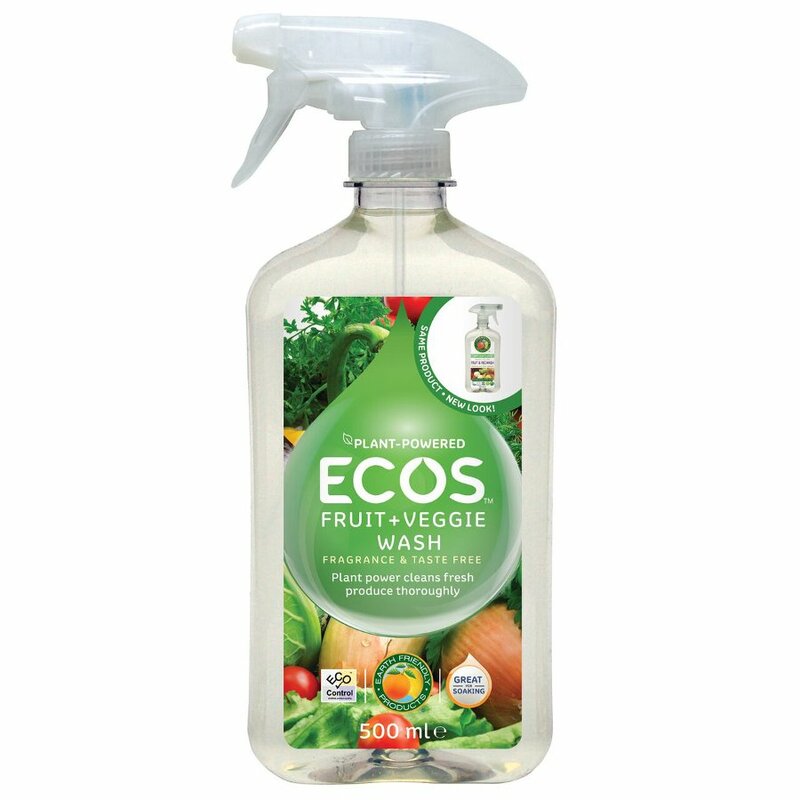 There are currently no questions to display about ECOS Fruit & Vegetable Wash - 500ml. Earth Friendly is a US based brand, which pledges that its products are all environmentally responsible, effective and value for money. 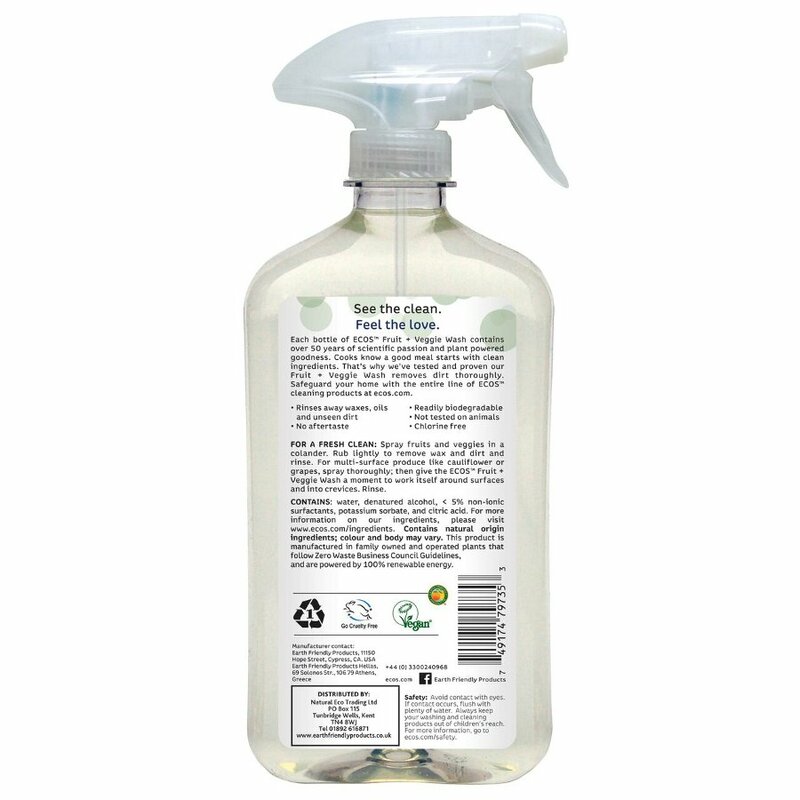 These environmentally friendly cleaning products are never tested on animals and do not include animal ingredients, making them the ideal choice for the vegetarian or vegan household. Earth Friendly products are readily biodegradable, non-toxic, free of phosphates, and have a neutral pH. Earth Friendly conducts business in a socially responsible manner that safeguards the earth and is a “champion” in the eyes of the Environmental Protection Agency for its use of safe surfactants (the wetting agents in detergent “that break down quickly to non-polluting compounds and help protect aquatic life in both fresh and salt water,” according to the EPA). Because they are plant-based and petroleum-free, the surfactants do not bio-accumulate or mimic human hormones, as many surfactants in conventional cleaning products do.